Latke Update on the classic: A latke with a surprise in the middle. Update on the classic: A latke with a surprise in the middle. Try salmon and green goddess, pulled brisket and BBQ sauce, cheese and marinara sauce or apples and sour cream. A latke with a surprise in the middle is a great way to update the classic Chanukah dish. Be creative and stuff latkes with anything you have on hand. Maybe even use it as a way to get your kids to eat their veggies by adding peas, broccoli, tomatoes, zucchini, or spinach. Start with my favorite Basic Latke Recipe. 1 Grate the potatoes and onion using a food processor or hand grater. Add eggs, salt and pepper to mixture. Then add flour (optional)*. 2 In a large frying pan, heat ½ inch oil on medium/high heat. It is important to make sure that the oil is hot enough to crisp up the potatoes but not too hot that the potatoes will burn. 3 Place a heaping spoonful of latke mix into the pan. The latkes should sizzle and crisp up quickly. 4 Once latke gets crisp, place filling inside (choose filling below). 5 Top with another spoonful of latke mix on top of filling and make sure that the potato mix on top of the filling completely covers the filling. 6 Flip over and fry for about a minute. 7 Drain on paper towels. Serve hot. The crispy potato latke, with the smooth fresh taste of salmon makes for a great combination. Green goddess dressing, a mixture of herbs and sour cream, adds color and flavor to this impressive latke. 1 Start with your favorite latke recipe, In a large frying pan heat about ½ inch of oil on medium/high heat. 2 Place a heaping spoonful of latke mix into pan. 3 Place a slice of salmon into latke mix. 4 Top with another spoonful of latke mix. 5 Flip over and fry for one minute. 6 Serve hot with green goddess dressing. To make the green goddess dressing; blend spinach, basil, dill, parsley, sour cream or yogurt, mayonnaise, lemon juice, garlic, salt and pepper. Place in container until ready to serve. This combination tastes similar to a pulled beef sandwich; the ultimate latke for any meat and potato lover. 1 Place a spoonful of latke mix in hot frying pan with oil. 2 Place shredded brisket or roast on latke mix. 3 Drizzle with teaspoon of BBQ sauce. 5 Flip over and fry for another minute. The earthiness of the potatoes and mushrooms make for a rustic and classic flavor combination. The sour cream adds richness to the latke. 1 Sauté shallot in 2 tablespoons of oil until translucent. Add mushrooms and thyme and sauté for five minutes; add salt and pepper to taste. 2 Proceed to make latkes in basic latke recipe. 3 Place a big spoonful of latke mix in hot frying pan with oil. 4 Place a small spoonful of mushroom mix on latke mix. 5 Top with another spoonful of latke mix. 7 Serve with sour cream. Our version of mozzarella sticks…latke style. A gooey, cheesy center with a hint of basil surrounded by crispy potatoes is a spectacular Chanukah treat. 1 Place a spoonful of latke mix into hot pan with oil. 2 Place a basil leaf on latke. 3 Place a bit less than a tablespoon of mozzarella on top of basil leaf. 4 Top with latke mix. 5 Serve hot with marinara sauce on the side. 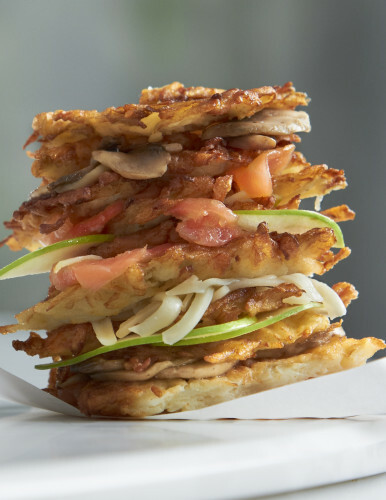 Inspired by the classic latke with apple sauce on the side, this latke takes on the flavors of an apple fritter. 1 Shred granny smith apples. Sauté apples with butter until softened. 2 Proceed according to directions in basic latke recipe. 3 Mix sour cream with cinnamon and sugar. Cool until ready to serve. 4 Serve with sour cream cinnamon topping. 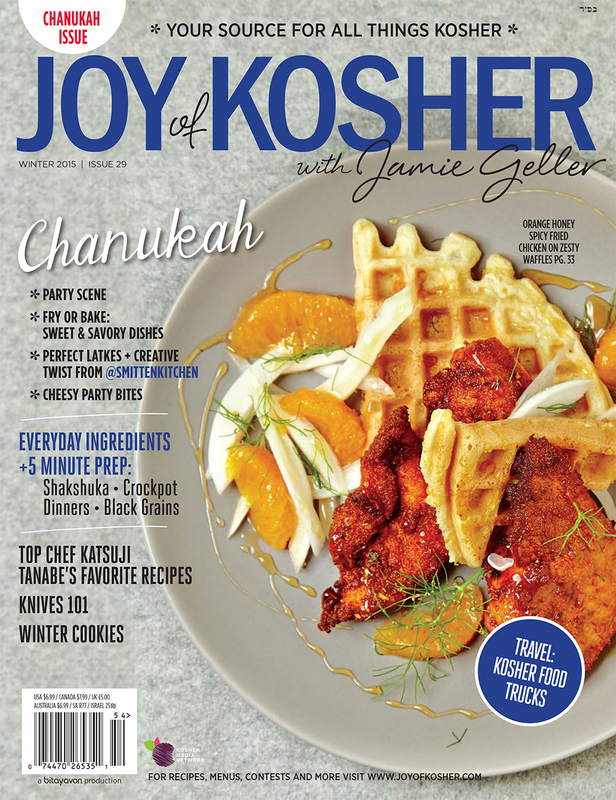 Check out the Chanukah/Winter issue packed with Chanukah: Party Scenes, Fry or bake sweet & savory dishes, Perfect Latkes + a creative twist by @smittenkitchen, Cheesy Party Bites. Everyday Ingredients +5 min Prep: Shakshuka, Crockpot Dinners, Black Grains & so much more! COOKBOOK SPECIAL!! Subscribe to Joy of Kosher Magazine for 2 Years for $51.99 and choose your free Cookbook – “Everyday Secret Restaurant Recipes” or “Joy of Kosher” www.joyofkosher.com/freebook This offer is only valid through the above link, in the U.S. while supplies last and cannot be combined with any other special offers available.